Here are the clothes coming to Paris & Italy with me! This method was EXTREMELY helpful when you need to pack light. I took photos of each outfit on my phone so I can just pull it out each morning and not have to fuss with what to wear. I think I actually know my outfit schedule better than our itinerary. Can you blame me? For this post I wrote the day and location on each photo so you could see them better. You’ll notice small pieces of paper by each outfit labeling them too for when I’m viewing them on my phone. There will be random rain storms amongst warm 80 degree days. In the regard, I’m luck to not need big bulky coats or boots. These outfits are made up of 5 pairs of shoes, 4 skirts, 5 dresses, 3 hats, 1 swim suit, 3 shorts, 1 pair of pants, 3 scarves, 11 tops, 1 pair of leggings, 3 jackets. I put them all in air tight bags. MAJOR space saver! I included bras and certain undergarments in each photo, depending on the cut and color of each top or dress. I hope to fit day 4-10 into a backpack for my flight to Italy. We stay in a different hotel each night so I’ll need to carry my luggage with me through out the day. My first instinct was to just throw everything I liked into my suitcase and figure it out there. I hope this strategy reduces stress and allows more time for sight seeing! What is your method of packing? what an impressive feat! you are so prepared. sounds like an awesome trip! Wow!!!!! You’re amazing!! Love all of your looks!!! Super chic! And so organized! Love it! Great idea! I saw something similar in Youtube last year and it seems to work pretty good. I need to try it too! Normally I’m the girl throwing everything she may need in the suitcase 🙂 and I end up taking too much with me..
Oh my gosh this is genius!! I love all of these choices and you totally utilized your pieces perfectly! Ohh awesome tips!! 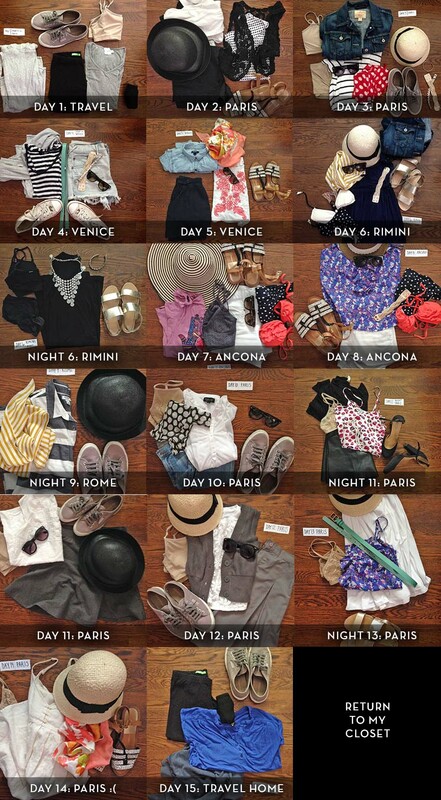 I JUST booked a trip to Paris last night and I hope I can be this organized when it comes to packing! Wow. This is quite possibly the coolest post I’ve seen in a long time. I ASPIRE to pack this preparedly – and never do. Love the photo diary. Travel safe!